Human-centered design research and consulting for Somerville High School (SHS) on how to shift practices to enable personalized learning for a diverse student body. For the Harvard Graduate School of Education course, Redesigning Education Systems for the 21st Century, my team worked with Somerville High School to offer recommendations on how to redesign their school system to enable personalized learning. Through human-centered design, we conducted in-depth user research, analyzed data, developed recommendations, and presented our research to SHS administrators. SHS is the only high school in the city of Somerville and serves a diverse student body of 1200 students. 57.4% of students speak a first language that is not English, 16.9% of students identify as having a disability, 39.6% of students are economically disadvantaged, and many students work as much as 40 hours a week to support themselves. Not only does Somerville High School serve a high-needs student population, SHS faculty and staff also operate under a strict bell schedule with limited breaks. Lack of time is a huge challenge voiced by students and staff alike. For instance, ELL students and those who work to support themselves find it difficult to complete assignments on time, while teachers have limited time to plan lessons period, let alone ones that are personalized to the diverse needs of their students. Our research uncovers several other barriers to personalized learning at SHS. In order to uncover the barriers to personalized learning at Somerville High School, we visited SHS and conducted two focus groups, one with students and the other with faculty and staff. According to faculty and staff, a major barrier to personalized learning is the lack of time to plan and customize lessons to the diverse needs of students, due to the student performance demands placed upon teachers coupled with the strict bell schedule that allows for less than 50 minutes per class and limited breaks in-between. Students also identified lack of time as a major pain point - specifically, the challenge of completing assignments on time while juggling other priorities like extracurricular activities and work. The small group of students we spoke to, who were handpicked by the administration, were all first generation immigrants who worked up to 40 hours per week to support themselves. During these conversations, faculty and staff continually mentioned students’ rising levels of stress and anxiety and their increasing need for mental health services. They explained that SHS students were requiring more mental health services than the school could provide. How might we address the diverse needs of students with mental health concerns in the general school environment? What is the most stressful part of your life? What do you think stresses your friends out the most? Who do you go to when you are stressed out? What do you do? What is the subject in school that challenges you most? Why? What would help decrease your stress at school? If you could design your ideal school day, what would it look like? Why? If there was an app that could help you with school, what would it do? After collecting data from students, we developed a survey for faculty, staff, and external agencies contracted to provide services to SHS students. We asked a series of quantitative (rating and ranking) and qualitative (short response) questions designed to understand the administration's perspective on the causes and potential solutions to student stress. We received 45 responses from 31 teachers, 7 counselors, 4 staff members, and 3 external agencies. To better understand the qualitative data we collected from students, we distilled our interview findings onto post-its and grouped them into common themes. One thing that students mentioned above anything else was the amount of homework (or "busywork") they had to complete on a daily basis. Specifically, they saw homework as taking up a lot of their time but not adding a lot of value to their education. Another major pain point mentioned was the lack of relevance students felt their classes had towards their futures, coupled with the pressure of tests and college applications. It's important to note that in addition to the main college prep program, SHS offers thirteen Career and Technical Education (CTE) programs, which are popular among students. Students who are admitted to a CTE program are also fully integrated into academic courses. Many students voiced that they found CTE courses to be more engaging and relevant than academic ones. In terms of the solutions, almost all students claimed that reducing the amount of homework and busywork would help to alleviate their stress levels. They also emphasized that giving them more choice in picking their classes and greater agency in their learning in general would be helpful. Students said that classes teaching them life and study skills would be ideal, in addition to more vocational classes. When asked about how technology could be used to help alleviate stress, students mentioned wanting a way to easily review past course content, assignments, and due dates, and to better communicate with teachers. Many mentioned that Google Classroom was a helpful tool, though not all teachers utilized it in their courses. Similarly, we mapped the qualitative data that we collected from the staff survey into common themes. The pain points that were mentioned throughout the survey included both the causes of student stress and the challenges staff and faculty faced in supporting students' mental health needs. We noticed a major discrepancy between the student and staff data. While students overwhelmingly stated that academic work was their main source of stress, SHS staff believed that family & personal circumstances were the main culprits, including factors like immigration and socioeconomic status, income levels, needing to learn English as a second language, and so on. Staff also stated that top-down pressures for students to perform well, leading to an overemphasis on testing, were major causes of student stress. The third most frequently cited cause of student stress was a tie between students’ mindsets (i.e. lack of resilience) and the lack of training for staff on how to help students manage stress and develop social-emotional coping skills. The quantitative data we collected from the staff survey corroborated this discrepancy. For instance, the questions below are part of a series of questions that asked staff to rank the factors behind student stress: academic work, extracurricular activities, school policies, social pressures, and student home life. 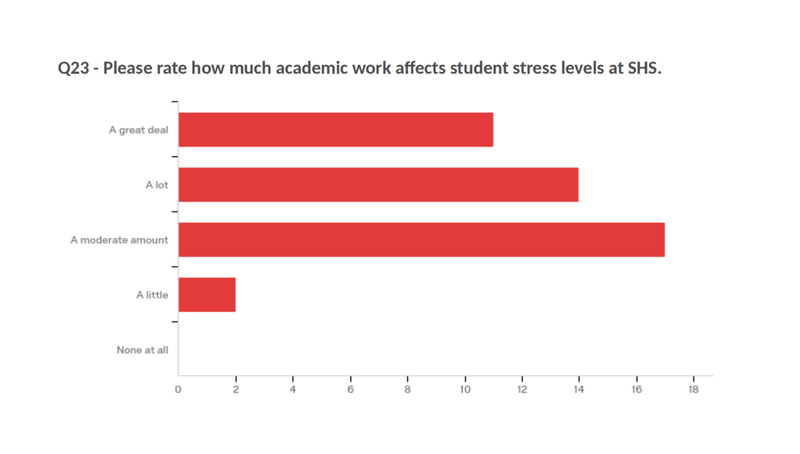 As you can see, most staff members believe that students' home lives affect their stress levels "a great deal," while academic work affects their stress levels only by "a moderate mount." The integration of Social Emotional Learning (SEL) into the curriculum, whether in all classes or through electives or gym, was the most highly recommended solution for alleviating student stress among staff. Although homework was not mentioned as one of the causes of stress, workload management was suggested as another main solution to student stress. For instance, some staff wanted the policy on maximum amount of homework per night to be more strictly enforced, or for there to be a way for teachers to communicate with each other in order to balance the amount of work assigned to students. In order to present our research to the SHS administration, I designed the data visualization diagram above to demonstrate the discrepancies between students' views on the causes and potential solutions to stress versus the staff's views. The frequency at which particular stressors and solutions are mentioned by both students and staff are visually represented by their size as well as distance from the horizontal centerline. The stressors and solutions are also color-coded by broad thematic categories (see below). The visualizations also include noteworthy quotes from the student interviews and staff survey. While our research points to major discrepancies between students and staff on the causes and potential solutions for student stress, it is worth mentioning areas where ideas align. Both groups agree that managing students’ workload would be a step in the right direction to alleviate student stress. Additionally, both staff and students agree that greater emotional support from staff would be helpful for student stress levels, with the caveat that staff receive more training in order to provide better support for students. How might we reduce stressors caused by in-school factors in order to alleviate the high demand for mental health services? We presented our research and recommendations to Principal Oteri and other administrators, who found the research we conducted, especially the data visualization, to be very helpful. Our recommendations are summarized below. 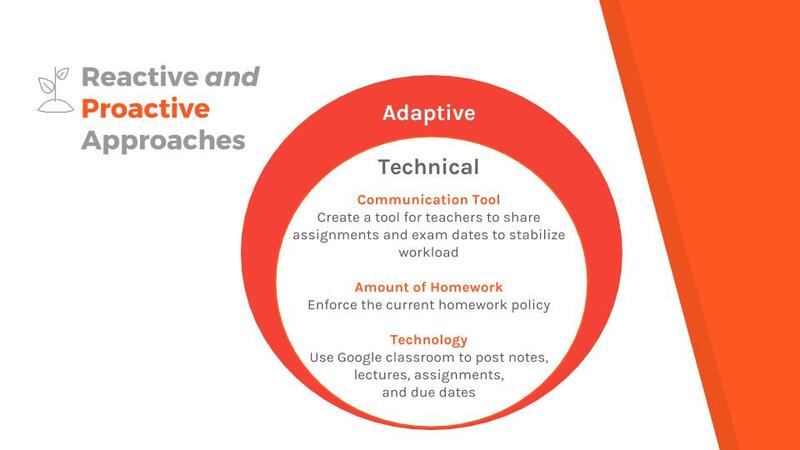 Our team realized that the challenges SHS students and staff were facing are not technical, but adaptive in nature. A technical problem can be solved with a clearly defined solution that is already within the range of expertise of the team. By contrast, tackling an adaptive challenge requires a long-term shift in a team’s priorities, beliefs, and habits. For each of the three adaptive challenges we identified, we suggested a range of technical tools for producing long-term adaptive shifts. The first adaptive challenge is about empathy and understanding. Through human-centered research, our team discovered that faculty and staff did not truly understand the root causes of student stress at SHS. To produce the necessary adaptive shift, we propose two technical solutions. First, we recommend that SHS revise its advisory system so that students can receive more individualized support throughout all four years. Second, we recommend that SHS conduct more frequent research on the challenges that students face. Another adaptive challenge for the administration to consider is the ability to differentiate between academic rigor and workload. Does more work truly equate to more rigor? Or does it just add busywork to students' schedules? In order to maintain academic rigor yet ensure that the work assigned is relevant and engaging, we propose that SHS employ a system to collect student feedback on individual assignments. We also believe that empowering students to choose their own courses and projects could increase engagement while not detracting from academic rigor. The third adaptive challenge considers how faculty and staff respond to student stress. Reactive approaches include interventions that address the symptoms of stress rather than the root causes. In the staff survey, many individuals suggested reactive measures such as yoga, mindfulness, and stress management training for students. Proactive approaches, on the other hand, address the root causes of stress. For instance, in order to manage the amount of work that students receive, Somerville High School may want to consider creating a communication tool for teachers to share info. on due dates and exam dates. Likewise, SHS might want to consider enforcing the 20 min. per night homework policy. Finally, technology can be used as a tool to help students prioritize their work and manage their time. The technical and adaptive solutions suggested are in an effort to create an environment conducive to personalized learning in the long-term and to reduce the demand for mental health support in the short-term. Given that SHS will be constructing a new school building by 2021 that will facilitate interdepartmental communication and collaboration, the few years leading up to that transition are an ideal time to make curricular and programmatic changes that align with the shift in physical space. This shift ought to include students at the center of the design process, empowered and able to make decisions about their own learning trajectories. Students should have the opportunity to learn and create in ways that feel relevant to their future goals, and to provide frequent feedback to the administration.